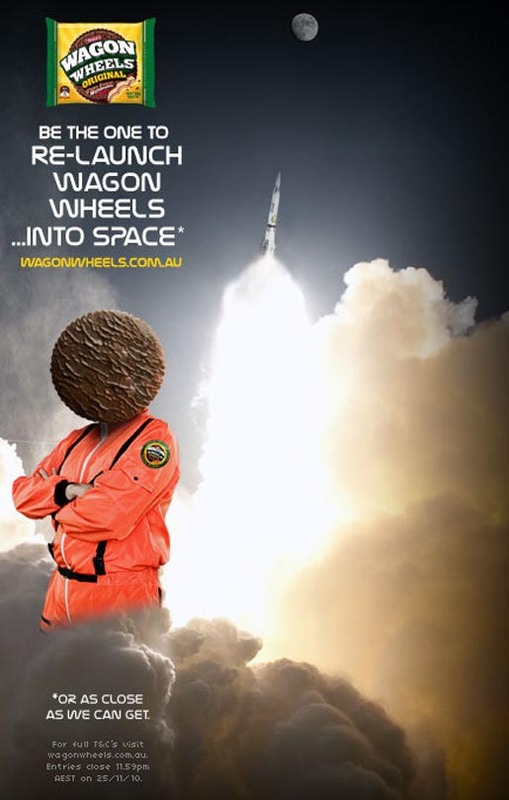 Arnotts, the Australian food company, relaunched Wagon Wheels in 2010 with an integrated advertising campaign featuring the team of four who came up with the original recipe. Nigel Harrison, Anton Nestarovic, Giles Fitzgerald and Marie Simmons are presented as the production innovation team behind the brand, originally developed at Westons. 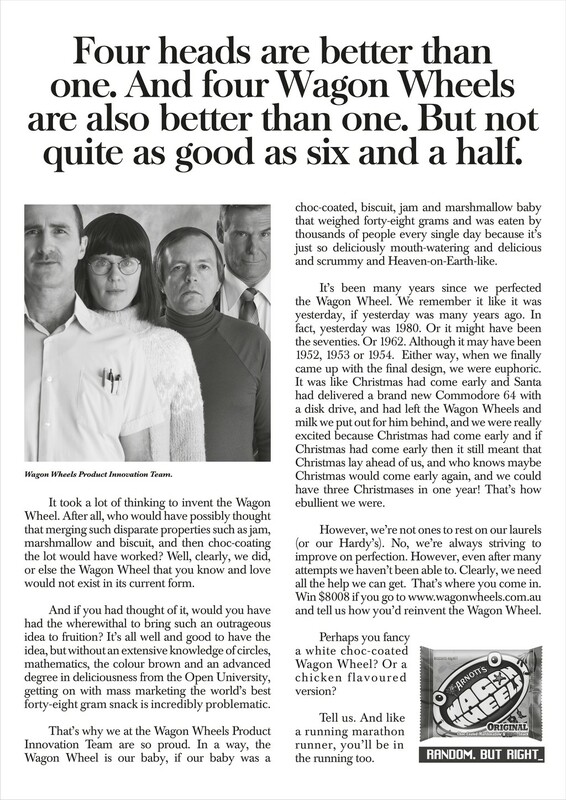 Online at Wagonwheels.com.au, Facebook, @Wagonwheeler and the WagonWheels YouTube channel, the campaign called for ideas on how the brand could be improved. 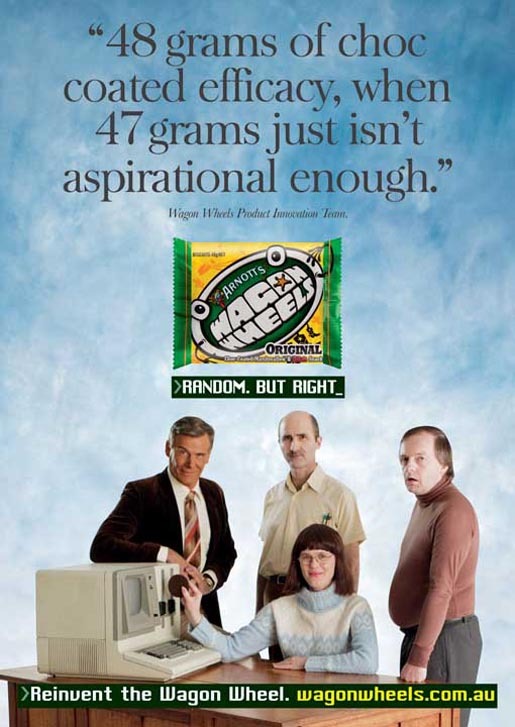 The “Four Heads” print advertisement, awarded a Silver Press Lion at Cannes 2011, provided a long type introduction to the “Random But Right” campaign. “Four heads are better than one. And four Wagon Wheels are also better than one. But not quite as good as six and a half. 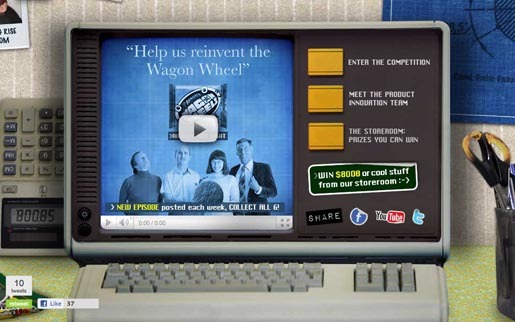 It took a lot of thinking to invent the Wagon Wheel. After all, who would have possibly thought that merging such disparate properties such as jam, marshmallow and biscuit, and then choc-coating the lot would have worked? Well, clearly, we did, or else the Wagon Wheel that you know and love would not exist in its current form”. The Four Heads campaign was developed at George Patterson Y&R, Sydney, by executive creative director Julian Watt, art directors David Joubert, Gilles Rivollier, David Jackson and Ant Simmons, copywriters Alex Wadelton and Michaela Brown, planner Moensie Rossier, art buyer Matthew Comensoli, typographer David Joubert, social media strategist Tiphereth Gloria, TV agency producer Blake Kendall, account manager Eleanor Rout, account supervisor Emma Boyle, working with Arnotts brand manager Jessica Cribb. Filming was shot by director Luke Eve via Jungleboys. Media was handled by MEC.